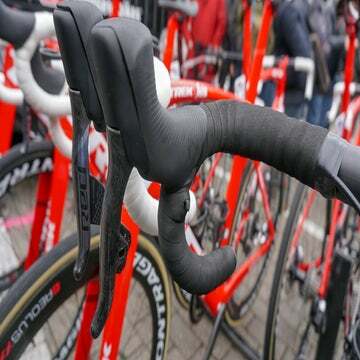 Rapha remembers Peace Race, SRAM expands eTap gear range, an inventor creates a goo to stick GoPros to bikes, and Scapin wins. Rapha launched several limited-edition products paying tribute to the Peace Race, a race born out of an effort to reunite war-torn countries behind the Iron Curtain. It was a two-week-long amateur event that first ran in 1948, the Course de la Paix, broadcasted the notion that sporting values could promote unity on a continent torn apart. National teams from around the world were invited to compete on a route through the Eastern Bloc states of Czechoslovakia, East Germany, and Poland. Rapha’s Peace Race Jersey and Board Game remember this race. The jersey is made of sport wool and includes button-on arm warmers true to the time period. It is available in four colors and each color represents either a prize in the race or a particular country’s national color from 1952. The board game was built to help players understand the political complexities of the Peace Race. Only 100 games were made so it will be extremely limited and is only sold with the jersey in a combo box. SRAM’s eTap wireless drivetrain can now accommodate wider gear ranges with the addition of an eTap WiFli rear derailleur. The longer cage derailleur works with 11-30- and 11-32-tooth cassettes so you can spin up steep climbs. SRAM says the new derailleur also optimizes chain gap for more consistent shifting across the range of gears. GekkoGum launched a Kickstarter campaign for a new way to mount your GoPro or smartphone while you shoot video or take photos. The GekkoGum is a malleable, adhesive ball that looks like clay. According to GekkoGum, a walnut-sized dollop of the material is strong enough and sticky enough to safely support your electronics. So you can stick your camera to your handlebars and then swap it to behind the saddle for a different video viewpoint on your ride. It is plant-based, doesn’t stick to your fingers, and is easy to carry around in a colored wrapper. Does it work? We hope so … for the sake of everyone’s smartphones. Scapin bike manufacturer launched its first road bike with disc brakes at the Italian CosmoBike Show in Verona, Italy last week. The Kalibra has a streamlined design with an oversized head tube joint to minimize vibrations from the front end of the bike. 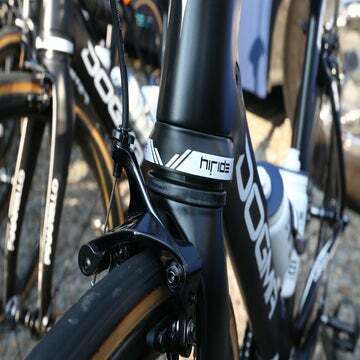 Stress points on the bike are built up to accommodate the added forces generated by disc brakes. Scapin won a CosmoBike Award for Quality in Design for the Kalibra Disc model.